What can I send to Malta? What items are restricted? Whether you are planning to soak up some rays on the beach or engage in a more active holiday, Send My Bag can help by sending your luggage to your hotel, so that it is ready and waiting for your arrival. You can also ship home your luggage and any purchases you have made. This will make your journey much more enjoyable, without you having to wait in baggage queues or at luggage carousels. You can also avoid airline baggage fees, including those for excess or oversized luggage. If you are a student studying for your degree in Malta, or maybe spending a third year abroad or gap year there, Send My Bag can send everything you will need for your stay in Malta. You can ship all sorts, from books, to clothes, and DVDs. No matter the reason for travel to Malta, you can save yourself a lot of stress by sending your baggage to Malta with Send My Bag. Send My Bag can take care of all your luggage for you, delivering it to your accommodation in Malta ready for your arrival. This means you don’t have to pack light in order to stay within your airline’s baggage restrictions. You can bring all the possessions you need to make you feel at home in Malta, while avoiding the stress of dragging heavy bags behind you through airports and onto public transport. To learn more about sending luggage to Malta, visit our ‘How it works’ page, or our ‘FAQs’. Malta is home to one golf club – the historic Royal Malta, dating back to 1888. You can try out this course using your own golf clubs by shipping them to Malta with Send My Bag. You will enjoy your round(s) of golf so much more if you are able to use your own beloved golf clubs. Shipping your golf clubs also means that you don’t have to deal with the hassle of carrying them through the airport or onto public transport. See our information on how to send golf clubs with Send My Bag, including how to best package your golf clubs. Why not explore Malta’s countryside by bike? You can do this using your own bike by sending it to Malta with Send My Bag, rather than checking it into the hold of your plane and potentially having to pay outsized baggage fees. You could even try a tour of one or two of the islands by bike by sending your bike to your first hotel and having it picked up at your final hotel. Your bike needs to be taken apart and safely packaged up before being sent to Malta. Check out our information on bike shipping to learn more. If you are going to live in Malta you will have to think about international removals to Malta in order to move all of your possessions too. Make sure you research removal companies thoroughly and choose one with good reviews. When you hand over your items ensure they are packaged up carefully so that they arrive intact. Use sturdy packaging for your items and tape everything up well. Malta’s largest institute of higher education is the University of Malta. Why not choose to study there and enjoy Malta’s mild climate all year round. Or, you could spend your gap year or third year abroad in Malta. Students can use Send My Bag to send their possessions to Malta, to allow them to set up home for the duration of their studies. Discover more about student shipping on our student page and find out how to receive your student discount. It’s no problem at all to send a parcel to Malta with Send My Bag. Sending a parcel is a great idea if you left some items at home when you moved to Malta. Friends or family members can put the items you have forgotten in a box and send them on to you. Make sure the sender knows to select a sturdy box and seal it up well so everything reaches you in one piece. Learn more about sending a parcel and find out what you can send with Send My Bag and how to package your items. If you need to send big items, such as an ottoman or a console table, to Malta you could choose air freight to transport them. Transit time is usually one to two days, so it’s a quick service. It can be quite pricey, though, with costs increasing as your shipment does. You will also need a customs agent to sort customs clearance, with their services needing to be paid for. Another cost to think about is getting your items to and from the airport. If you send internationally by air freight to Malta your items will likely arrive at Malta International Airport. Sea freight or container shipping is another option for shipping large bulky items, like a bed or a writing desk. Sea freight shipping to Malta can take a number of weeks, so it’s a good option if you don’t need your items immediately. This option can be considerably cheaper than air freight, but you will still need to hire a customs agent and will need to arrange the transport of your items to and from the ports. This means the cost could be significantly more than expected. When using container shipping to Malta, your items will most likely arrive by ship at one of the major ports, such as the Port of Valletta or the Port of Marsaxlokk. Highly recommendable after one experience! Long may it last. The majority of countries allow consignees to ship a large amount of personal items, known as personal effects, duty-free across their borders. Personal effects are normally considered to be used items that have been in the sender's possession for 6 months or more. Because of this allowance, most Send My Bag shipments are not stopped by customs. You must demonstrate to customs that your shipment consists of personal effects. To do so you must complete a short packing list online, with entries to be made in the following format: "1 x Denim Jacket, 5 x Pairs of Socks, 4 x Cotton T-Shirt", and so on, rather than as "10 x Used Clothing". If Maltese customs find brand new or commercial items in your shipment, it may be assessed for customs duties and taxes. If you are sending Christmas or birthday gifts to Malta please check with Maltese customs so you are aware of any customs duties that need to be paid, follow any advice they give you and attach all necessary documentation. We ask all travellers to take 5 minutes to check how their personal circumstances and what they are sending will be viewed under the customs regulations of their destination country. This is because customs rules and allowances vary according to country. Malta is an excellent holiday destination due to its warm climate, its beaches, its historical sites and many other attractions. The climate of Malta is typically Mediterranean with hot and sunny summers and cooler winters, but with temperatures rarely dipping below 10°C. The heat of a summer’s day is often tempered by pleasant sea breezes. The country’s capital is Valletta, which has a population of 198,000 people. It is a very historical city with many architectural highlights. Moreover, Valletta has been chosen as the 2018 European Capital of Culture. Attractions in Malta include Calypso Cave, which is said to be the cave that Homer wrote about in The Odyssey. 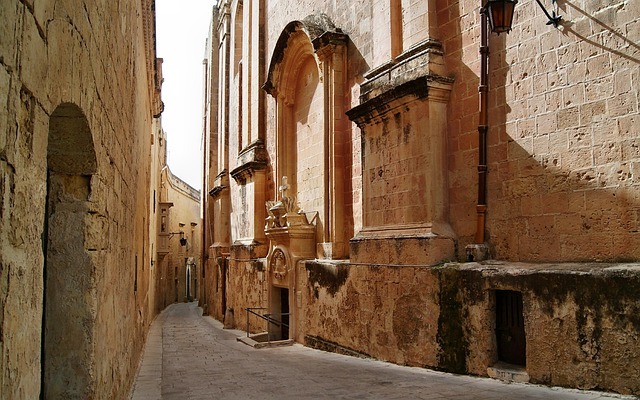 There are also several museums to take in, including the Basilica Museum and the Cathedral Museum on Gozo, Casa Bernard – a late 16th-century palazzo – and the beautiful palace, Casa Rocca Piccola. Malta and Gozo are ideal for walking expeditions, particularly around their rugged coasts. You can also enjoy sports such as windsurfing, snorkelling, jet and water skiing. For days spent lounging on the beach, the best spots include Paradise Bay and Armier, or Ramla l-Ħamra on Gozo. Other, busier, beaches include Mellieħa Bay, Għajn Tuffieħa and Golden Bay.